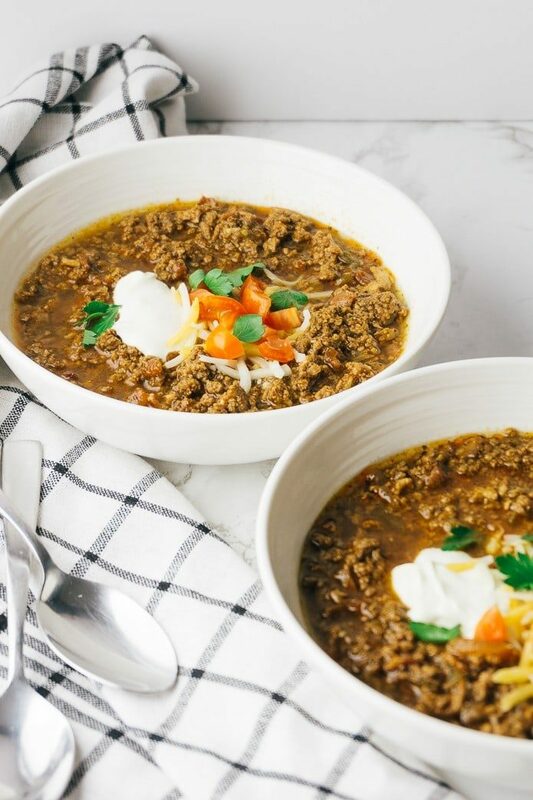 You’ll love this recipe for delicious keto chili made with ground beef — and get this — no beans. It’s easy to throw together in your Crockpot or Instant Pot. And bonus — it’s perfect to make for freezer meals, too. I hope you enjoy it as much as we do! Chili is one of those dishes that elicits very strong opinions from food lovers! Some cooks love beans in their chili, some love tomatoes. And others believe that the only real chili is “Texas style” chili with no beans or tomatoes. This keto-style chili, in my humble opinion, has some of the best of both camps. It’s made with ground beef, some tomatoes and onions, and get’s its delicious flavor from a blend of chilis. But, to keep it low-carb, it’s made without beans. What does it mean for a chili recipe to be keto-friendly? With a ketogenic diet, you are going for a diet that is very low in carbs, high in fat, and medium in protein. Most people on keto average around 20-30 grams of carbohydrates a day — maybe a bit more if you are in maintenance mode. Keeping that in mind, I developed a recipe for keto chili that has roughly 7 grams of carbs per serving, before toppings. Beans are generally avoided on the keto diet. Legumes, beans, and lentils are high in fiber and very nutritious. However, as starchy grains, their high carb count won’t help you reach the state of nutritional ketosis. 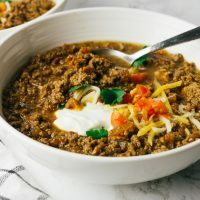 This recipe for keto chili starts off with ground beef. Ground or cubed beef is commonly used in a traditional red chili like this. But, if you’d like to use something different, just about any meat would work in this recipe. You could try using ground turkey, chicken, or pork to change things up. And, if you’d like to add more low-carb vegetables to your meal, try adding chopped celery, zucchini, cauliflower, mushrooms, or spinach! Jalapeno. I added one diced jalapeno, and our chili had a mild/medium level of heat. If you are sensitive to heat, feel free to add less. Fire roasted tomatoes and chiles. Canned diced tomatoes will work well, too. Remember that carb-containing ingredients like tomatoes, onions, and garlic are spread out over multiple servings! I like to serve this recipe with sour cream, grated cheddar cheese, and cilantro. It would also be delicious with more jalapenos, diced avocado, or extra bacon. I love having freezer meals stored away in my freezer. 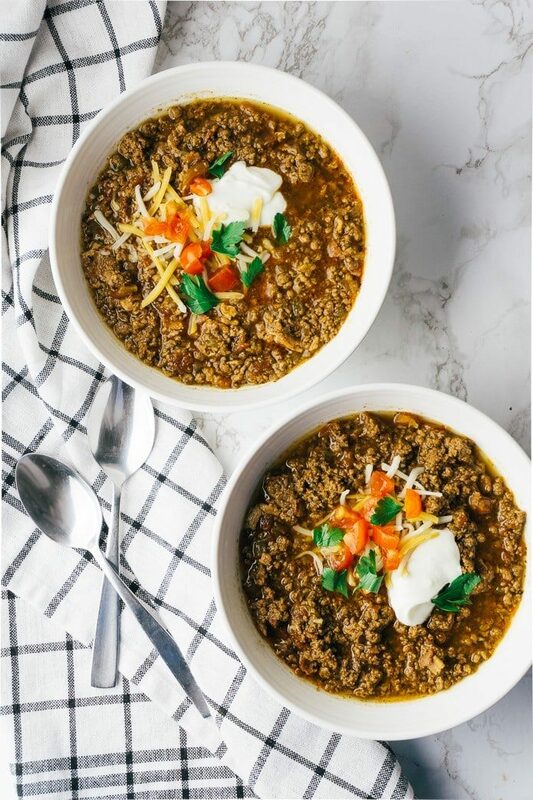 Fortunately, this keto chili recipe is perfect for freezing. This recipe makes a big batch – plenty to serve for dinner right away and enough to store in the freezer for later. 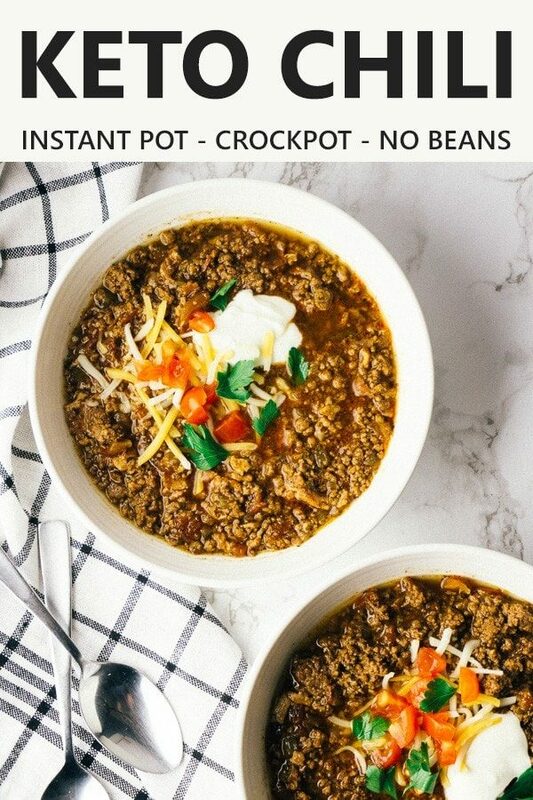 If you have a large Crockpot or Instant pot, you could even make a double batch. You can make this keto chili 3 ways. On the stovetop, in a Crock Pot, or in an Instant Pot. First, cook the bacon, onions, garlic, and jalapeno. Then, brown the beef. Add the tomatoes, spices, and stock, and simmer away. 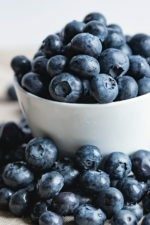 If you are using the Instant Pot, I recommend using the “Natural Release”. Natural Release reduces the temperature more gradually, resulting in more tender meat and better texture. If you like cooking with ground beef, you may also like Keto Lasagna with Zucchini Noodles, Keto Egg Roll in a Bowl (Crack Slaw), Keto Stuffed Peppers (without rice) and Mozzarella Stuffed Meatballs. 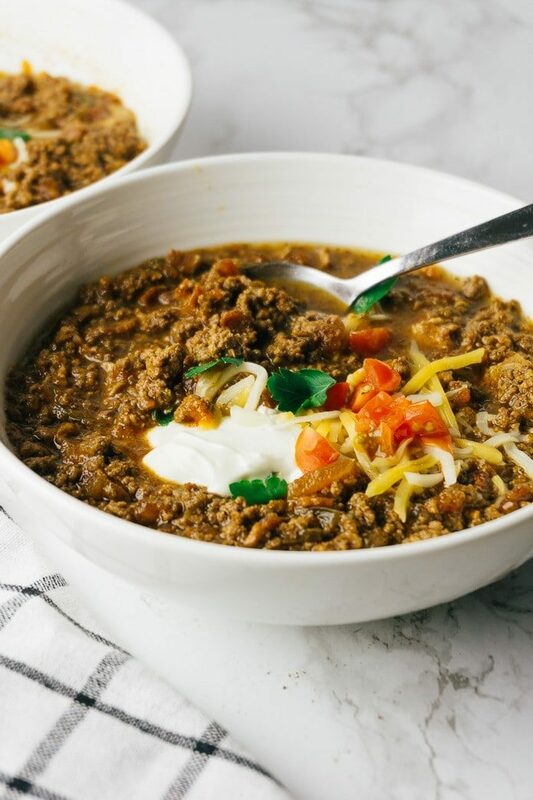 You'll love this recipe for delicious keto chili made with ground beef -- and get this -- no beans. It's easy to throw together in your Crockpot or Instant Pot. And bonus -- it's perfect to make for freezer meals, too. I hope you enjoy it as much as we do! In a large skillet over medium-high heat, cook the diced bacon for 5-7 minutes, until browned. Add the chopped onion and cook for for 5-7 minutes, until soft translucent. Add the garlic and jalapeno and cook for a minute or two, until fragrant. Transfer the ground beef mixture into a slow cooker. Add remaining ingredients: tomatoes, chili powder, cumin, oregano, salt, and broth. Cook for 6-8 hours on low or 3-4 hours on high. Select the "Sauté" setting on the pressure cooker. With the lid off, add the diced bacon and cook for 5-7 minutes until browned. Add the chopped onion and cook for 5-7 minutes, until soft and translucent. Add the garlic and jalapenos and cook for a minute or two, until fragrant. Add remaining ingredients: tomatoes, chili powder, cumin, oregano, salt, and broth. Stir until combined. Close the lid. Press "Keep Warm/Cancel" to stop the saute cycle. Select the "Meat/Stew" setting (35 minutes) to start pressure cooking. Use a natural release. In a large pot over medium-high heat, cook the diced bacon for 5-7 minutes, until browned. Add the chopped onion and cook for for 5-7 minutes, until soft translucent. Add the garlic and jalapeno and cook for a minute or two, until fragrant. Reduce heat to low. Cover and simmer for 30 minutes - 1 hour for best flavor, stirring occasionally. Beef: I usually make it with 85/15 beef. If you want to use a higher fat meat, you might want to drain it after browning, before mixing with the other ingredients. The nutrition information is provided as a courtesy and is approximate only. It was calculated by My Fitness Pal with the recommended brands and ingredients. All brands are different, so please verify the macros with your specific ingredients to ensure accuracy. If you try this recipe, let us know! Leave a comment, rate it, and don’t forget to tag a photo #greenandketo on Instagram. Welcome to Green & Keto. 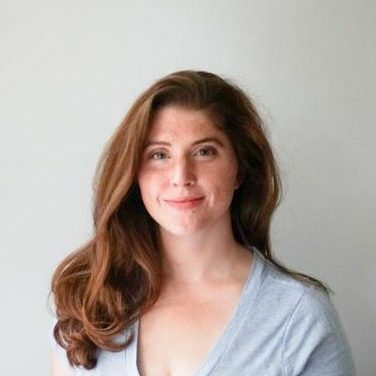 I’m Sarah — wife, toddler mom, and food lover. I’m so excited you’re here and I can’t wait to share my low-carb recipes and meal plans with you. Follow me on Pinterest and Instagram. And don’t forget to join our Facebook Group! 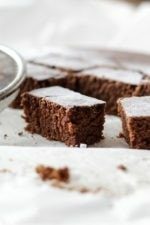 Subscribe for Free Keto Recipes! 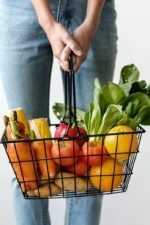 Get the latest recipes and my Free Grocery Guide. This looks delicious!! My husband and I dislike beans in chili or anything for that matter. This is perfect. How long can it store in the freezer? I plan to make this stove top style in the next couple days, but it is only the hubs and I, so we will definitely be storing it.